The model is derived from the deductive iteration of the subgrid scale stress transport constitutive equations. The model has an additional term over the mixed model, which accounts for an independent modeling of the backscatter. The model coefficients have been evaluated both analytically and using dynamic approach. Bypass transition flow physics is one of the least understood problems in fluid mechanics, with researchers and engineers wrestling with it for decades. One of the primary hurdles in the development of physics-based models is the lack of proper understanding of the turbulence dynamics in the transition boundary layer. This research aims to improve the understanding using systematic high-fidelity DNS studies, and by focusing on TKE and stress budget analysis. Vortical structures show the generation of Klebanoff modes in pre-transition region, and hairpin structures during transition. Bhushan, S. and Walters DK., “Dynamic Coefficient Evaluation for an Algebraic Subgrid Stress Model Using a Scale- Variant Approach,” International Journal of Numerical Methods in Fluids 74 (3): 169-188, 2014. Bhushan S. and Warsi ZUA. “Large Eddy Simulation of turbulent channel flow using an algebraic model” International Journal of Numerical Methods in Fluids 49: 489-519, 2005. Bhushan, S., Alam MF and Walters D.K., Evaluation of Hybrid RANS/LES Models for Prediction of Flow Around the DARPA SUBOFF Geometry, Computers and Fluids 88: 834-849, 2013. Bhushan S. and Walters DK. “A dynamic hybrid RANS/LES modeling framework,” Physics of Fluids, 24, 015103, 2012. Bhushan, S, Borse, M., Walters, DK. 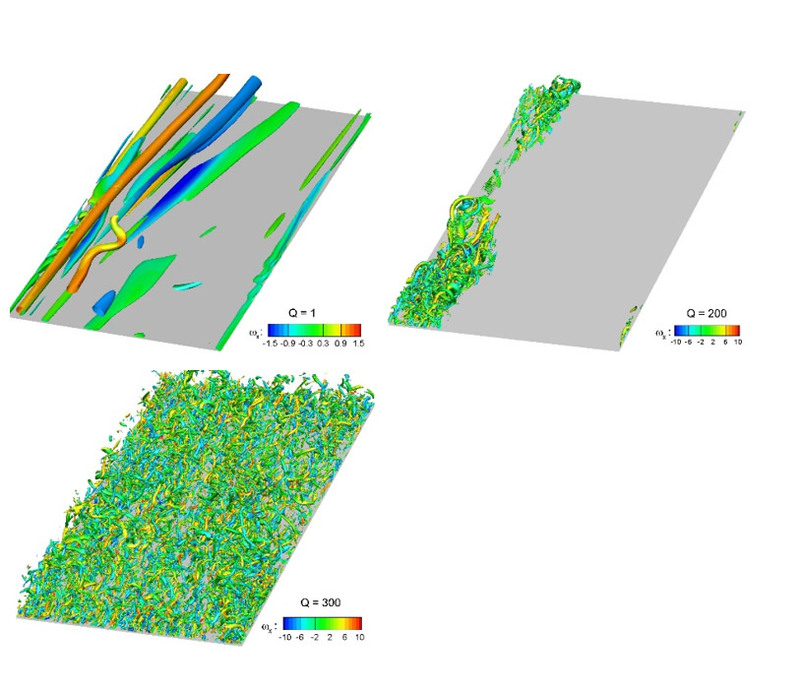 and Pasiliao, C. Analysis of turbulence generation and energy transfer mechanism in boundary layer transition using direct numerical simulation. Proceedings of the ASME 2016 Fluids Engineering Division Summer Meeting, July 10-14, Washington, DC, USA, 2016.